Bring to boil, a big amount of water in a large pan, then pour the package of pasta in it, stir well cover until it comes back to a boil, uncover and stir the pasta again. Continue to stir often until it is cooked al dente, but not mushy. Pour the pasta in a colander, drain the water and pour some cold water over the pasta to stop it from continuing to cook in the heat. In a saucepan sauté the onions in the coconut oil until golden then add the zucchini and butternut squash, stir well from time to time until they are tender so they don’t stick to the bottom of the pan. On the side, pour the tahini and the umeboshi paste into a cup, add a few tablespoons of hot water and melt down with a spoon until creamy, add more water if needed. When the pasta is ready pour into a serving bowl, pour over it the tahini sauce and stir well. Then add one half of the zucchini and squash and continue to mix well. 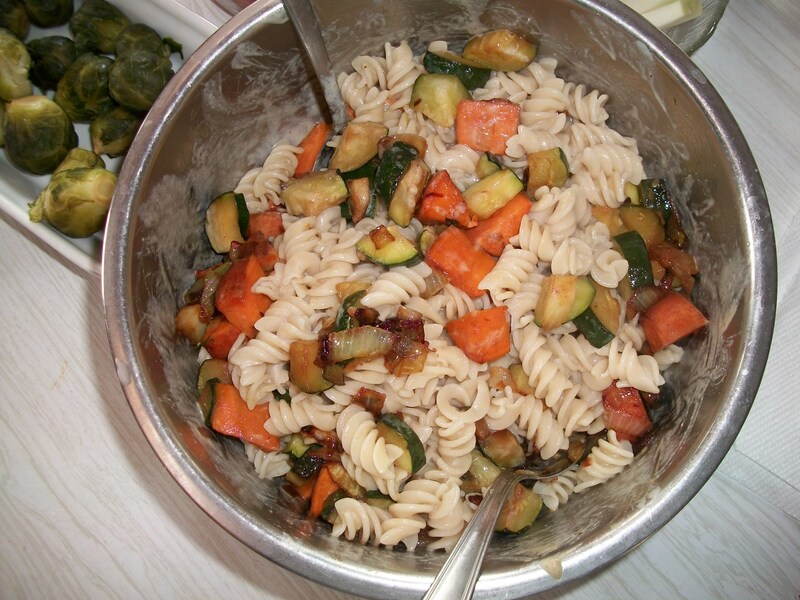 Leave the other half of the zucchini on the side in order to put a spoonful on top of each serving of the pasta to garnish it.